Welcome to Shelf-Clips.com. Since 2010, we’ve been the leaders in pallet rack safety clips, industrial shelving clip products, and all related information. Our mission is to connect you with the clips you need in a way that’s fast, simple, and enjoyable. Our in-stock clip inventory dwarfs that of other online sellers so that you can have confidence that your clips will be in-stock and ready to ship. The friendly Shelf-Clips.com customer service team is available by phone or email to make sure you’re getting what you need, when you need it. Best of all, with our secure online ordering you can place an order with just a few clicks and have your order arrive in days. Safety clips are an essential component of your rack system, and play a major role in keeping your warehouse safe. To find pallet rack safety clips, just navigate to our pallet rack safety clip catalog by clicking the tab under “product categories”. We carry safety clips from industry giants like Ridg-U-Rak, Unarco, Speedrack, SpaceRAK, Redirack, and others. We also offer the Universal Pallet Rack Safety Drop Pin, which is one of the most popular and widely-used pallet rack safety pins available on the market. Finding the right industrial shelving clips can seem impossible. We make it easy by including over 25 of the leading industrial shelving clip brands in one place. Our clip catalog spans from Republic to Lyon, Quantum Storage to Edsal, and almost everything in between. 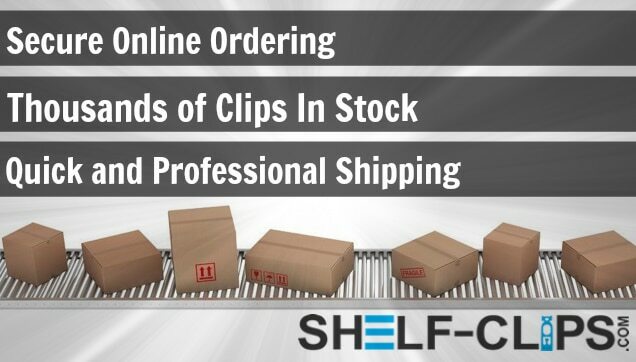 See for yourself by clicking the “Shelving Clips” link under “Product Categories”. If you don’t find what you’re looking for, you may be able to find it on our Clip Identifier.